Why are the brand new northbound lanes so bumpy and rough? We thought there was a steering issue with our car at first. Will they be repaired? Dan, this project includes grinding sections of I-5 that weren’t repaved to eliminate ruts. As we grind those sections, we will also grind the surface of the brand new pavement to smooth it. We will be arriving from Colorado at Sea-Tac on Saturday afternoon, July 14th. What is the best way to go North to Bellevue from the airport? 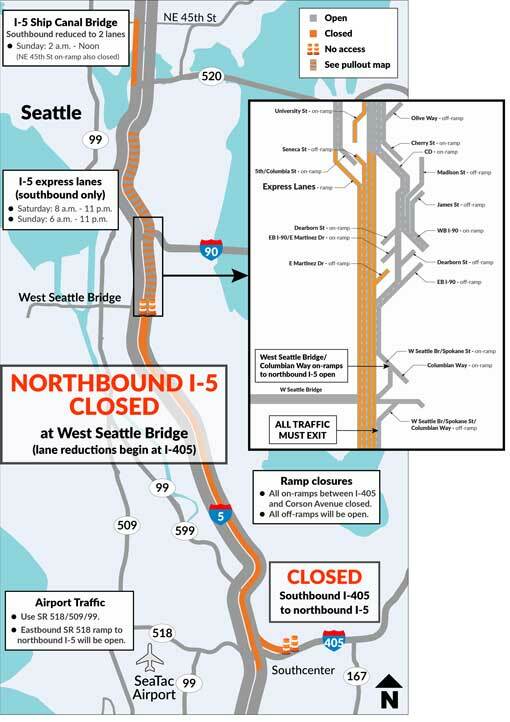 What is the alternative route for northbound I-5 traffic? Why is there not a map posted online showing the alternative route? Donna, I-405 is usually the best way to get to Bellevue. The best alternative route depends on where you’re going. If you’re headed to SoDo, SR 599/99 or SR 509 is probably best. 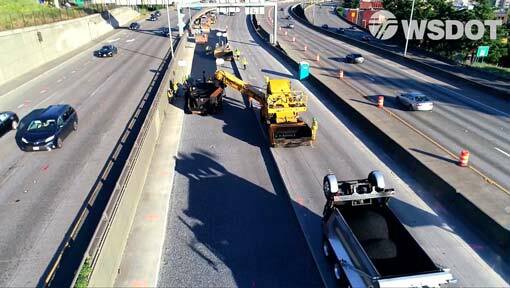 If you’re going to downtown Seattle, SR 599/99 or SR 509 can work, or you can take I-405 north to westbound I-90. If you’re going north of Seattle, northbound I-405 is the best route. As far as a map showing detours, that is difficult because people are going to so many different destinations. Lol! Love the comment, 'If drivers use the system like a normal weekend, backups will be horrific.' Its normal because that is LIFE. So stop living life to accommodate WSDOT. Really? As if people have a CHOICE???? Come on WSDOT, REAL WORLD HERE. 24X7 society. We still need to function as a society. CHANGE YOUR THINKING!!! You are unrealistic if you think the world can just stop to accommodate YOUR antiquated 9-5 M-F concept. Tom, you're writing as though there is an alternative. The whole road has to be closed in order to a) perform the maintenance and b) not put workers in danger. When else would you suggest they do this work? The work needs to be done, and there's less traffic on weekends, so that's when it gets done. You can either adjust your plans, or you sit in awful backups. Your call. Hello. We are first time visitors to the area and will be flying out of SeaTac on July 14 and need to be at the airport by 3:00 PM. We will be driving N from Olympia and have a rental car to turn in so alternate transportation is not possible. We would greatly appreciate suggestions with specific details such as exits and time allowances on how to best accomplish this, given past experience. Thank you so much. It’s been a wonderful visit to a beautiful area. For people traveling on north I-5 to SeaTac International Airport the weekend of July 14-15, the northbound I-5 off-ramp to SR 518 (exit 154A, the main route to the airport) will remain open all weekend. If drivers want an alternative, take exit 152 off northbound I-5 and go west on South 188th Street, then north on SR 99/International Boulevard. If you’re unfamiliar with the area, you might want to allow an extra 30 to 45 minutes; it’s always better to be a bit early than a bit late. As long as we’re talking airport traffic, for those leaving SeaTac airport, if you’re going into downtown Seattle, your best bet is probably to go west on SR 518 to SR 509, then go north on 509. SR 509 connects with SR 99 in south Seattle and will take you to downtown. If you’re going north of downtown Seattle from SeaTac, northbound I-405 is probably your better choice. If you’re going to the North Seattle/Shoreline area, from I-405 you can take either I-90 or SR 520 back across Lake Washington to I-5. If you’re going to Lynnwood or points north, you can continue north on 405 to where it rejoins I-5 in Lynnwood. Why is the Sounder train not running when these closures happen? It runs for Mariners games. WSDOT, Dan specifically mentioned NEW sections being bumpy. I too noticed some of the new work is rougher than what it replaced. Sound Transit makes the decision when to operate special Sounder service. We plan to go back and grind a thin layer to smooth out the surface once paving is finished. Will will be able to use 99 N from the West Seattle Bridge? 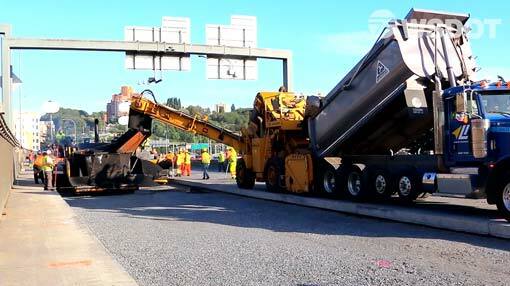 People will be able to use the regular ramp from the eastbound West Seattle Bridge to northbound SR 99.